Exchanges between Taizé and India go back many years: with Taizé brothers and young volunteers going to India and young Indians going to Taizé. 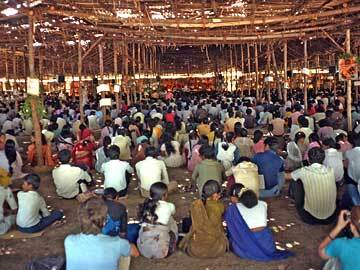 It was after the first Taizé meeting in Madras in 1985 that groups of young people from the sub continent started arriving in Taizé. They come from all parts of the Indian Union and they reflect the diversity of the cultures represented in this vast country. Catholics, Orthodox, Church of South India, Church of North India, Martoma, Lutherans and Baptists, they are chosen by their local churches or by Indian youth movements to spend the duration of a three month visa in Taizé. Taking part in the international meetings and sharing in the responsibility for the daily running of these meetings, their presence in Taizé is above all to share with the young people from many countries how the faith is lived at home in India, with the challenges and the questions that that represents at the present time of great changes in Indian society. The international meetings in Chennai (Madras) in 1985 and 1988 were outstanding events for everyone who took part in them. Each of them brought together several thousand young Indians – from throughout the country and from many churches … as well as young adults from other Asian countries and even farther afield. With the tomb of Saint Thomas the Apostle in the Cathedral of Madras-Mylapore, Christianity in Madras goes back to the earliest times and today the Christian community there is one of the largest in India. And in October 1995, the Findings of the National Catholic Youth Survey said: “The Taizé brothers, through their “pilgrimages of trust and reconciliation” have never ceased to accompany Indian youth and they have greatly contributed to the renewal of youth apostolate in this country”. What has happened since the Madras meetings? Through the years, there have been meetings of many different kinds and too numerous to mention; from Assam to Tamil Nadu, from Meghalaya to Kerala. In 1996, the “Pilgrimage of trust in Ranchi” brought together several hundred young adults from Gumla, Hazaribagh, Simdega, Dumka, and Muzzafarpur. In 2001, there was a similar event in Andhra Pradesh. All of the meetings have as their general theme, “Inner life and human solidarity”. Sometimes it is possible to give practical expression to the search for solidarity. Following the earthquake in Gujurat in January 2001, in collaboration with Taizé, the regional youth director and two young people from AP went to Gujurat to see what was happening in the devastated areas. The visit resulted in a gesture of material support for some of the families who had lost everything in the earthquake. Brothers are frequently asked to take part and to lead prayer during the course of one or other of the national conventions for the youth of the various churches. Brother Roger was back again in 1997 for the funeral of Mother Teresa, and, in spite of the sadness of the occasion, he was filled with joy at being able to visit India and Calcutta once again. He stayed in the same place as his previous visit, and was able to discover the neighbourhood again and meet some of the people he had met all these years before. He stayed with the same family; and each evening there was prayer at the house. For the 5 to 9 October 2006 meeting in Kolkata, Brother Alois, the new prior of Taizé, will be present, together with several of the brothers. This meeting will be an important new stage in the pilgrimage of trust in India.